Civility as we pursue it is the ability to disagree productively with others, respecting their sincerity and decency. It does not mean that you will come to an agreement with others, but simply won’t villainize them in a way that invariably leads to an inability to compromise, harsh words, and other ugly behavior. Recently, many have taken issue with those in their workplace, like Peter Thiel at Facebook, who have supported Donald Trump’s campaign. 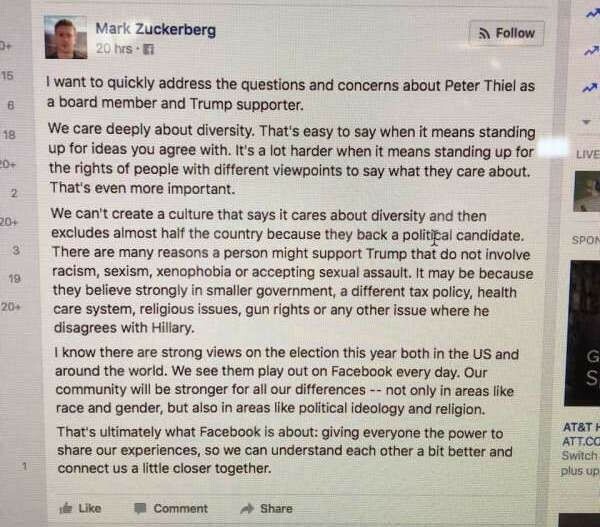 As Mark Zuckerberg writes , it is easy to be civil with people we agree with, but trying to create an environment that respects people of all viewpoints requires us to give people the benefit of the doubt – that disagreement does not necessarily come from a place of evil. The full letter, posted internally to Facebook employees, is shown above and is well worth reading. As traditional newspapers decline in popularity, more and more people are turning to the internet to stay informed. Internet users can seek out web versions of established news publications like The New York Times and Wall Street Journal, or they can take their pick among thousands of political blogs covering all sides of the political spectrum. Political blogs, in particular, encourage reader interaction and debate, and reflect the democratization of the internet in that anyone who wishes to can create one and garner thousands, if not millions, of followers. A major concern with this transition to internet news sources is that people will tend to seek out those publications that reinforce their own views to the exclusion of all others, thereby creating online echo chambers of political thought, and leading to increased polarization and incivility. First, they predicted that political bloggers would tend to express opinions that align with the particular ideology of the blog they write for, leading to polarized opinions between conservative and liberal blogs. They predicted the same would be true of the blogs’ comment sections. Next, they predicted that incivility would become more frequent as political extremity increased in either the post or comment sections, and that most of this incivility would be directed towards off-site political opponents. Researchers were also interested in comparing political blogs with those blogs published by established newspapers. 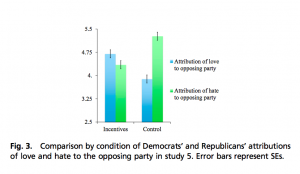 They predicted that the latter, which tend to encourage a higher level of objectivity, would display less political bias both in the posts and comment sections, as well as less incivility than the political blogs. To test these hypotheses, the Occupy Wall Street (OWS) movement of 2011 was used as a case study. Five popular blogs spanning the political spectrum were chosen for comparison, as well as two newspaper blogs, from The New York Times and The Wall Street Journal. Blog posts about OWS and their comments were coded for the author or commenter’s stance toward the OWS protests, specific groups or persons (including the blog author or another commenter) praised or criticized, and whether any criticism was uncivil. As expected, political bloggers expressed opinions that were in line with the particular political bent of the given blog—authors on the conservative blogs opposed OWS and those on the liberal blogs supported it. 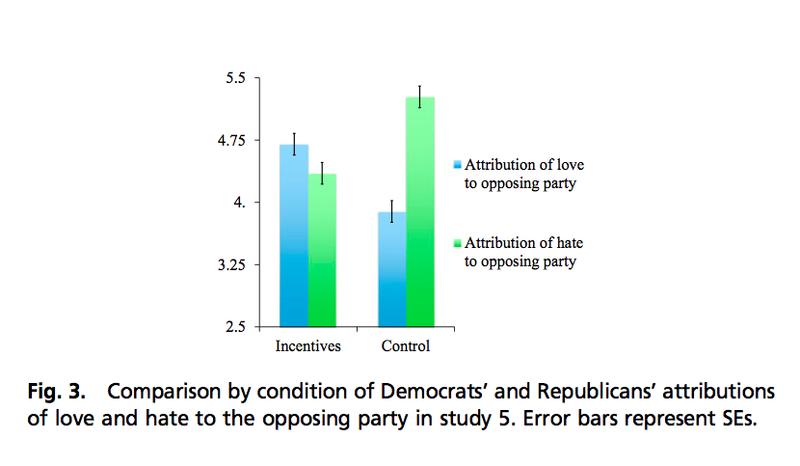 Blog comments showed a similar trend, though they were somewhat less polarized. Also as predicted, incivility increased as blog content and comments grew more extreme, and was most frequently directed at off-site opponents. Newspaper blogs were found to be significantly less biased than political blogs, as were the commenters on these blogs. Newspaper blog authors and commenters also displayed less incivility. Authors and commenters on 2 liberal blogs—Daily Kos and firedoglake; 2 conservative blogs—Townhall and MichelleMalkin; and one moderate blog, TheModerateVoice. Authors and commenters on The New York Times and The Wall Street Journal blogs. Suhay, E., Blackwell A., Roche, C. & L. Bruggeman. “Forging Bonds and Burning Bridges: Political Incivility in Blog Discussions about Occupy Wall Street.” (2014) Unpublished manuscript, American University, Washington, D.C.